Autumn is my favourite time of year; I love the cozy nights in, the big jumpers and – mostly – the food. Comfort food brings so much happiness and risotto is one of the best. It’s so filling and warming but doesn’t actually have to be particularly fattening. The creaminess comes from the rice itself so it feels naughtier than it is. To make “real” risotto you need to put the time in and be willing to stand over a stove stirring for 30 minutes but for some strange reason I love doing this. I find the repetitive process really soothing. I guess I’m a little odd. I’ve experimented a lot with risotto over the years and this recipe is definitely in the top three for taste and simplicity. Fry the leek, garlic and oregano in a little butter or oil until softened. I very rarely cook with butter, usually opting for olive oil, coconut oil or Fry Lite instead, however there is something about leeks that seems to call out to butter for me. But of course, be as healthy as you wish. Add the rice to the pan and toss through until the grains turn slightly translucent. Add the wine and cook for a few more minutes. Then the time consuming/awesome part; add the stock one ladle at a time and stir until absorbed. Repeat until all the stock is used and your risotto is at the desired softness (I prefer mine slightly al dente). Add the bacon, frozen peas and half the cheese, heat through. The key to a good risotto, in my opinion, is the stock. If you’re really fancy you can make your own but I use the Knorr stockpots, two for one litre of water, and the flavour is lovely. Risotto is so versatile and can carry lots of flavours. We also love pea & mint, made using a pea puree at the wine/water stage, sausage & rosemary and chicken & pesto too. Once you get the taste for it the flavour combinations are endless. If you have leftover risotto (which you often do as it’s so filling), why not try making risotto balls? I’ve not got around to this yet but they look amazing, and would be great for baby-led weaning. Want more recipes? Check out the others in my series. Enjoy! 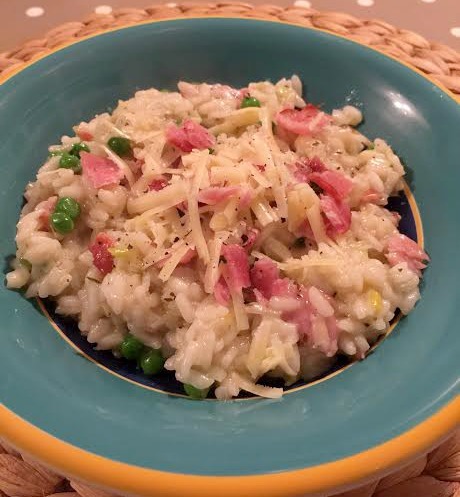 Great winter dish – my little one loves veggie risotto with cheese! Mummy in a TuTu (@mummyinatutu) recently posted…Sleep: What is That Anyway? Mmmmmmmmmmmm just when you think bacon can’t get any better you add it to risotto – bacon heaven !! !